IT/business function partnering leads to valuable technologies and productive organizations; four characteristics are key. Improving IT alignment with business functions is a top 10 challenge on every CIO survey we have seen for many years. Why is it so difficult? Our work with clients indicates strong partnering between IT and business functions tends to happen in pockets, for periods of time, and is generally dependent on individuals. When and where partnering happens, there tends to be a great deal of value realized from the technology implemented. When partnering is nonexistent, productivity limps along because the technology doesn’t meet the organization’s needs. As part of our IT strategy work at Pariveda Solutions, we’ve initiated numerous surveys around alignment. The recurrent themes in organizations that feel they get good value from their technology center around trust and the importance of the soft skills exhibited by IT personnel—whether they are developers, administrators, project managers, or IT management. 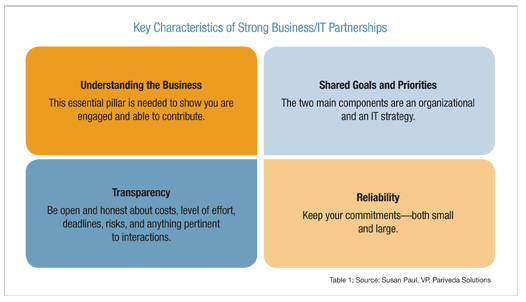 Key characteristics of strong business function/IT partnerships include understanding the business, shared goals and priorities, transparency, and reliability. (See Table 1.) These seem simple, but they are far from easy. These are not the skills taught in computer science or management information systems curriculum, and many technology personnel are not comfortable with the softer skills required. So how do you make these skills a part of the fabric of your IT organization to facilitate more frequent partnering? Indeed IT business is serious matter thus consultation is very necessary upon the upon the launch of the business and fti consulting able you to provide a consulting services you need.